Please, send me more information about ref DM4383 in Las Brisas, Nueva Andalucia or similar properties. 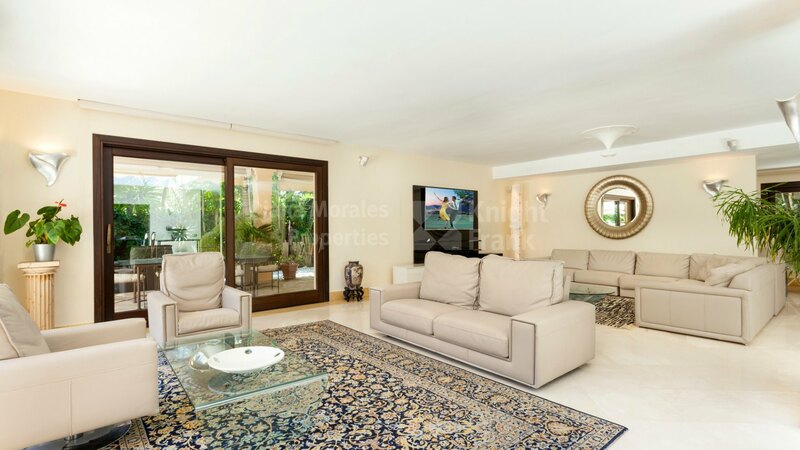 This south facing villa is situated in Nueva Andalucia at approximately 900m from the nearest commercial area of Aloha and surrounded by three golf courses of Aloha, Los Naranjos and Las Brisas. 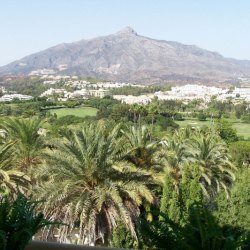 The beach and Puerto Banus are approximately 3kms away where there are also many commercial and professional services of every kind. The property offers entrance hall with guest toilet, modern refurbished kitchen open to the spacious lounge with dining area and exit to the covered terrace. There are three bedrooms with two bathrooms on this level. One of the bedrooms is en-suite and two others share a separate bathroom with a hot tub. The lounge has an exit to the garden with barbecue area and jacuzzi. The upper floor is entirely occupied by the master bedroom equipped with shower, double sinks and WC. The bedroom has a balcony and a terrace with staircase to the roof terrace with golf views. The semi-basement is quite spacious and features one car garage, laundry room, storage, cupboards, and the fourth bedroom with shower and lounge which could be used as staff quarters. Additionally, the house is fitted with air conditioning, underfloor heating powered by diesel, marble flooring, wooden carpentry, double glazing, electric shutters, heated pool, outdoor jacuzzi.